Occupational Therapy Show 2017 It's that time of year again! The Occupational Therapy (OT) Show 2017 will be at the NEC in Birmingham and Burning Nights CRPS Support charity will be exhibiting there once again on Stand E85! The Occupational Therapy Show is considered to be the UK's largest dedicated event aimed at Occupational Therapists (OTs). This year it's taking place on 22 & 23 November 2017 at the NEC in Birmingham. Interested in coming along to the Occupational Therapy Show 2017 and meeting some of the Burning Nights CRPS Support charity's team? 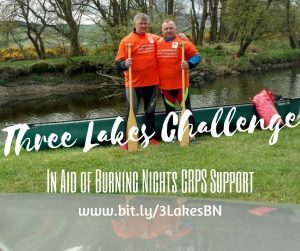 You need to register for your ticket but this is easily done via the Burning Nights CRPS Support bespoke registration link. Here are some of our photos from the Occupational Therapy Show 2016 If you do visit our stand (Stand E85 Burning Nights CRPS Support charity) at the Occupational Therapy Show 2017, please speak to our team about our CRPS awareness sessions and put your name down. After the show we will be in contact with you by email to discuss the awareness sessions in more detail. If you don't get the chance to speak to any of our volunteers at the Occupational Therapy Show 2017 but you're interested in our CRPS awareness sessions, please email Victoria our Founder who will give you all the necessary information. Look forward to meeting you at Stand E85! 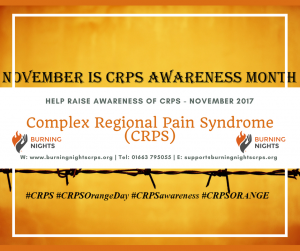 Burning Nights CRPS Support, the UK charity dedicated to raising awareness and supporting all those affected by Complex Regional Pain Syndrome (CRPS) will be exhibiting at this year's Occupational Therapy Show 2017 at the NEC, Birmingham. You can find us on STAND E85 Occupational Therapy Show 2017 Meet Burning Nights CRPS Support charity on Stand E85 At the Occupational Therapy Show 2017: Access over 100 OT focused and interactive lectures, seminars and practical workshops Over 70 hours of FREE CPD accredited education to choose from Learn from world-renowned speakers and experts Update and refresh your learning across physical, mental health & learning difficulties, children & families and innovation, plus many more hot topics and specialist areas including research sessions and the poster zone Research and source new products and services through a network of 270+ trade exhibitors and suppliers. Occupational Therapy Show 2017 If you want to find more about CRPS, our charity or even about our CRPS training sessions that we offer, then come and visit us on STAND E85 at the Occupational Therapy (OT) Show in Halls 9 and 10 at the NEC in Birmingham, UK! Look forward to meeting you there! Written: 10/10/2017 LET'S SPREAD AWARENESS of CRPS!